Many digital cameras offer a choice of autoexposure metering modes. Metering mode means the way in which the camera’s autoexposure mechanism meters — measures — the light in the scene while calculating the proper exposure for your photograph. You can usually choose from matrix metering, center-weighted metering, and spot metering. 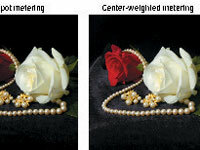 1When the background is much brighter or darker than the subject, use center-weighted or spot metering. In matrix metering mode, your subject may be underexposed or overexposed because the camera adjusts the exposure to account for the brightness of the background. 2Frame the shot with the subject at the center. You can also use spot or center-weighted metering without the subject in the center of the picture. 3Press the shutter button halfway to lock in the exposure and then reframe the picture, if you want. As long as you keep the shutter button halfway down, the camera retains the initial exposure setting. 4Press the shutter button completely down.